Judging by the Cover – 11/28/18 new releases – AiPT! David and Eric share their favorite covers from the week’s new comics. In that spirit, here are the covers that captured Toy Editor David Hildebrand and Manga Editor Eric Cline’s attention this week. I dig noir-ish looking artwork and Shalvey hits me right between the eyes with this cover. I appreciate the shades of black and white and you gotta love the splash of red blood thrown in for good measure. It also looks like something out of a manga book. An incredibly detailed angry Logan and a stack of dead bodies. What more could you want on a cover? I think I chose a Red Sonja cover the last time I did this. Maybe I should read more of the title since the covers are always eye-catching. I dig this because it looks like an old Saturday Evening Post cover. Sonja is willing to slay for mead, and judging by the look on her face her quest isn’t going well. I dig the colors of the cover from her fiery red hair down to dull colors of the bottles tipped over in front of her. I love all of Amanda Conner’s covers. She is incredibly talented and always creates entertaining covers. Here you have Old Lady Harley making her getaway with who appears to be an Old Lady Catwoman! Old Man Ridder and Old Man Freeze are hot on their trails. My favorite part of this cover is the cart they are making their escape on. Spikes on the tires, kitty cats in a basket and of course stolen jewelry! Keep it up, Amanda! Is there a cooler X-Man than Storm? I certainly can’t think of a better one to put on a cover to make me interested in buying the book. Especially now, in what’s one of her best costumes ever. 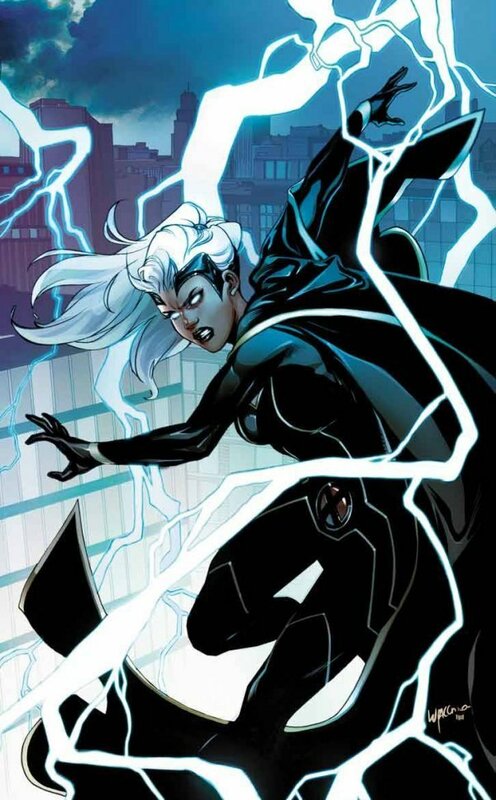 The sleek black suit, combined with the fantastically drawn, zigzagging lightning, makes Ororo look badass. The shift from blues in the top half to whites in the bottom half is also pleasing to look at. Cool work all around. This latest Black Panther run has been a fun breath of fresh air. Seeing T’Challa and co. reinvented in a cosmic context is awesome, and Killmonger looks very intimidating here. From the posing to the flames to the tattered cape, this piece is extreme and it works. I always love seeing western comic book characters drawn in more manga-esque styles. The sense of energy here is fantastic, from the way Flash literally races across panels to the intense sound effects. The shading and motion lines are also lovely. All in all, this is just a cool image.